Entry-level version of Volvo's XC90 looks surprisingly good value for money, especially considering how well equipped it is. Four-cylinder diesel version of BMW's largest SUV is available in five- or seven-seat form. Here, we're testing the seven-seater. Nearly a decade old but ageing gracefully. Still sets the standard for outright space, but fuel economy and CO2 emissions are decidedly yesteryear. The original Volvo XC90 was something of a trailblazer. Big, graceful and with seven seats as standard, it was heaven sent for well-heeled families who’d been crying out for a more upmarket way to ferry around people and paraphernalia. Naturally, it sold by the bucketload. 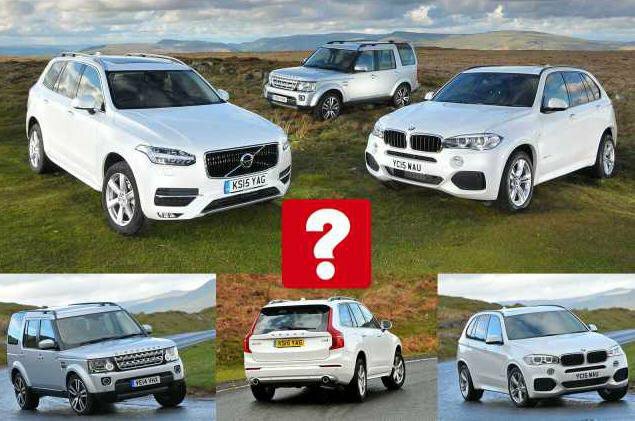 That was 14 years ago, though, and Volvo’s pioneer has long since been overtaken by some of the cars it helped to inspire, including the blue-collared Land Rover Discovery and the seven-seat version of the latest BMW X5. However, Volvo has a second shot at both of those rivals with the new XC90. Like its predecessor, the latest model is big and has seven seats, but this time it comes packed with even more features to make family motoring safer, less stressful and more entertaining. Just a few years ago, all big 4x4s were fairly cumbersome to drive, and the truth is the Discovery is a relic from that era. It weighs around half a tonne more than its rivals and doesn’t disguise that extra heft very well at all. Round corners, the Land Rover’s tall body leans dramatically, making quick direction changes all but out of the question. This isn’t an SUV that feels at home on twisting country roads, then, and it’s even less well suited to town driving where its slow, heavy steering and unwieldy nature make it tricky to manoeuvre. Venture off the beaten track, though, and the Discovery will get you places its two rivals could only dream of going. The XC90 immediately feels lighter on its toes than its British rival. Its steering is faster, so less armwork is needed to get round tight corners, and there’s far less body sway through bends. It’s a pity the steering doesn’t give you a little more feedback at faster speeds, but at least it’s always precise. Sadly, the Volvo doesn’t ride as smoothly as you might hope. It’s too easily flummoxed by potholes and patched-up road surfaces, and you don’t just feel bumps, either – you hear them, due to noisy clunks from the suspension. The Land Rover’s softer suspension irons out ripples and small bumps more effectively, helping the Disco lope along smoothly – especially on the motorway. Sharp-edged bumps and potholes cause the body to shudder a bit around town, but that’s preferable to the constantly unsettled nature of the Volvo. Meanwhile, the BMW manages to combine the best of both worlds: tidy handling with a supple ride. Admittedly, our test car was equipped with adaptive comfort dampers, a £1495 option that allows you to stiffen and soften the suspension at the touch of a button. However, in this spec the X5 is the most comfortable of the three at all speeds and easily the most nimble and car-like through corners. It's just a pity the steering doesn't communicate a little better. Performance is the one area that isn’t hampered by the Discovery’s considerable mass. Its muscular six-cylinder diesel engine wafts the big Land Rover up to speed snappily enough, and its automatic gearbox shifts smoothly the majority of the time. 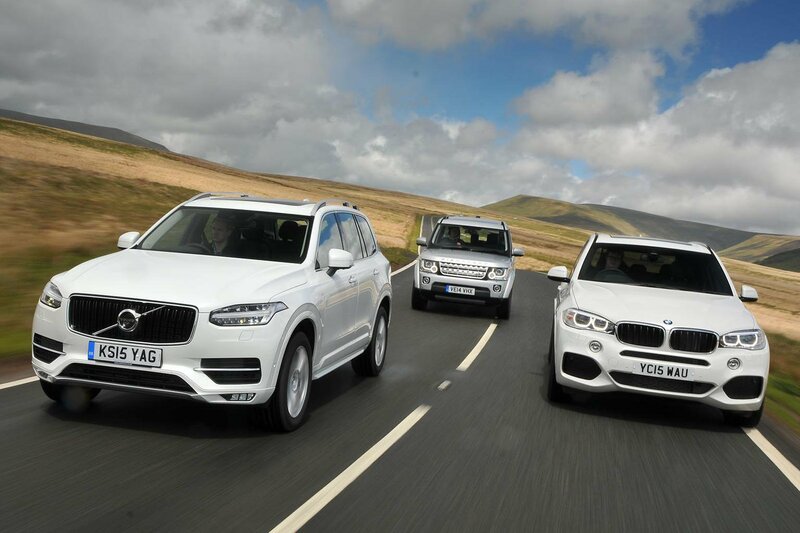 The BMW and Volvo will get you up to speed slightly faster, and both have more refined engines. 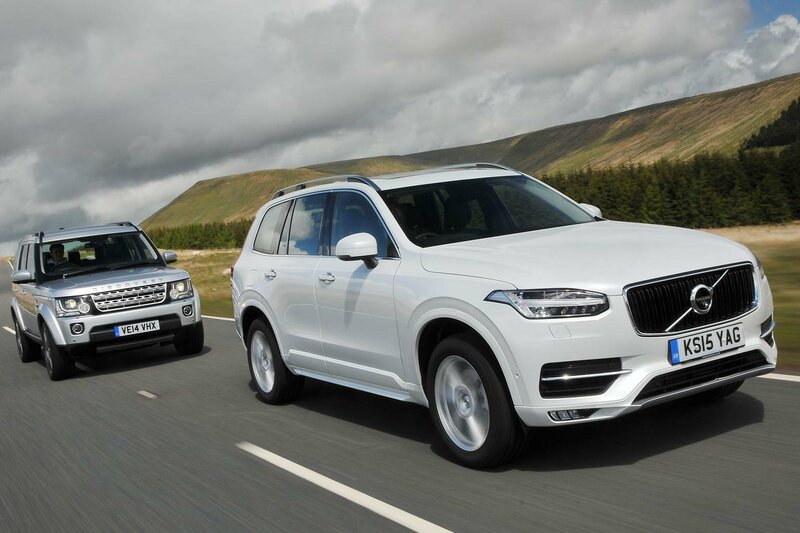 The XC90’s is slightly quieter, largely because its gearbox keeps the revs low unless you need a sudden burst of acceleration, whereas the X5’s ’box tends to hold the revs higher in most situations. Disappointingly, though, the XC90's tyres generate quite a bit of road noise – particularly over coarse surfaces. The X5 is better in this respect, but still kicks up more road roar than the Discovery. It's the other way round when it comes to wind noise, though; the Land Rover is worst and the Volvo best.